Enterprise Collaboration Usage & Interest Sitting in a business meeting can feel like panning for gold: You can spend a lot of time sifting through worthless information before you strike that valuable nugget. Of course, many view business meetings as long, tedious, and generally unproductive affairs. I find that these typically are the people who are not paying full attention in these sessions. These are the people who wind up generally being generally oblivious even when the discussion turns to something important. Nevertheless, the stereotype of the unproductive business meeting remains firmly rooted in our corporate culture, even as we introduce more and more technological capabilities. So, let’s focus on how executives can use technology to make business meetings better for participants. Simply put, this is a daunting task. The beauty of business meetings is in the eye of the beholder. If you’re one of those people that hate them, there’s little I can say to change your mind. Even when collaboration tools make meetings easier and more efficient—even with far-flung colleagues—the stereotypes about business meetings die hard. No amount of slick software can change that fact. You can use whatever meeting or collaboration technology that suits your fancy, and the results of the meeting for some will never change. The sales guy is always going to complain about not getting enough new leads from the marketing department, and the folks from IT will moan about not having the time or the resources needed to deploy their solutions. And most everybody will leave assuming that none of their colleagues will remember a word they said. You may want to give up hope that technology can make a difference, but don’t lose heart just yet. It’s precisely at the juncture—when the real-time collaboration endswhere technology can actually pick up and make a substantial difference for end users up and down the executive suite. That’s because streaming solutions can be employed to capture virtual meetings and presentations conducted via video conferencing systems, web conferencing services, and other networked meeting venues. Sure, people may not listen to you during the meeting itself. But, somewhere on the corporate network, streaming technology platforms just may have recorded your brilliance and preserved it for future generations. Or, at the very least, are saving your contributions until your next employment review. Of course, these capabilities are not quite ubiquitous just yet. Only 26% of those participating in a fourth-quarter 2014 survey of 1,201 executives conducted by Wainhouse Research report that they work at organizations that have integrated such streaming capture solutions that can record meetings held via traditional video conferencing systems and make them available for later replay online. 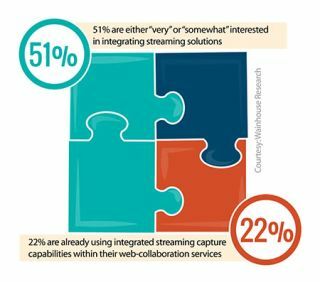 Only 22% of organizations report integrating streaming capture capabilities with the web collaboration services that they use. Nevertheless, corporate interest in these types of solutions that can be used to capture and manage content originating in collaborative venues is high. Fifty-one percent of executives surveyed say they are either “very” or “somewhat” interested in integrating streaming solutions that better enable the distribution of video conferencing content to computers and mobile devices. A comparable total of respondents express interest in integrating these capabilities with existing web collaboration deployments. In short, a lot of executives are interested in recording the meetings that take place on their networks. And just exactly what do executives hope to achieve with systems that can make a record of these meetings? Wainhouse Research in its survey asked executives to grade the relative importance of issues to be considered when mulling investments in technology that would enhance their organization’s ability to store meeting content captured from video conferencing systems for later replay online. Many survey respondents said it was “very important” to implement such “collaboration-to-streaming” solutions in order to better leverage existing investments in video conferencing equipment and deliver a standardized message to a broader audience. But neither of these options rank as the top rationale for integrating streaming with existing collaboration solutions. Instead, it’s the “preservation of institutional knowledge” that emerges as the issue most frequently cited as a “very important” rationale influencing their organization’s decision to invest in integrating streaming capabilities with their networked meeting venues. Overall, 51% of survey respondents cited “preservation of institutional knowledge” as a very important issue. Central to the task of “preserving institutional knowledge,” of course, is the practice of employees sharing best practices and past experiences. Here’s where the value of the business meeting shines through. While this corporate information always can be tracked via internal memos or e-mail archives, sometimes these are stories that are best learned just by listening to a colleague. So, take heart, weary business executives. No one may be listening to you in your meetings now. But it seems like a lot of people are interested in recording what you say so that other people can hear your words of wisdom someday down the line. Knowing that somebody, someday will actually be listening to what you have to say? Now, that is what I call an innovation in collaboration that truly enhances the end-user experience.